This field study assessed phosphorus dynamics (crop-P uptake, resin-extractable P in the root-zone, P mobilisation and microbial-P) in break crop-cereal rotation sequences at four Australian semi-arid field sites differing in soil P fertility. Phosphorus mobilisation (9–30 kg P ha−1) was apparent under break crops, consistently under canola and peas at three sites with low soil P fertility (i.e. pre-sowing soil resin-extractable P < 20 mg P kg−1). Enhanced biological cycling of P (i.e. increased microbial-P) was limited to a low P site in the break crop phase. Phosphorus content of break crop aboveground residues following grain removal was 1–7 kg P ha−1; P input was greater (12–18 kg P ha−1) where legumes were green/brown manured. Varied residue P input did not result in differences in resin-extractable or microbial-P in soil prior to sowing wheat. Phosphorus uptake was greater for wheat after legume break crops compared to continuous wheat (2.0–4.7 kg P ha−1) at all sites, especially where crops were green/brown-manured (3.9–5.9 kg P ha−1). Greater P uptake by wheat was associated with increased grain yield at three sites but was not significantly correlated with the quantity of P input from break crop residues at all four sites or with soil mineral nitrogen pre-sowing of wheat at three sites. Break crops can directly contribute to P resource-use efficiency by mobilising residual P from soil but the agronomic significance of P supply from break crop residues to a P uptake benefit for following wheat remains to be elucidated. The online version of this article ( https://doi.org/10.1007/s10705-019-09977-0) contains supplementary material, which is available to authorized users. Financial support was provided by GRDC Project UA00119. 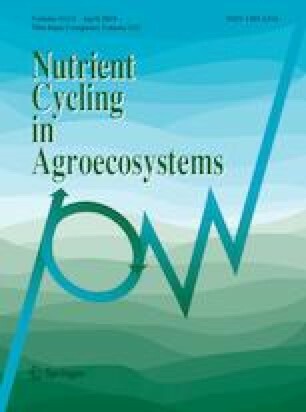 The authors wish to thank the following organisations for provision of the sites and acknowledge their collaboration: Mallee Sustainable Farming and CSIRO Ecosystem Sciences (Karoonda), Birchip Cropping Group (Hopetoun), Agriculture Victoria (Longerenong), and CSIRO Plant Industry Canberra and Farmlink (Junee). Thank you to Philippa Tansing, Duy Nang Nguyen and Girish Choppala for technical assistance.